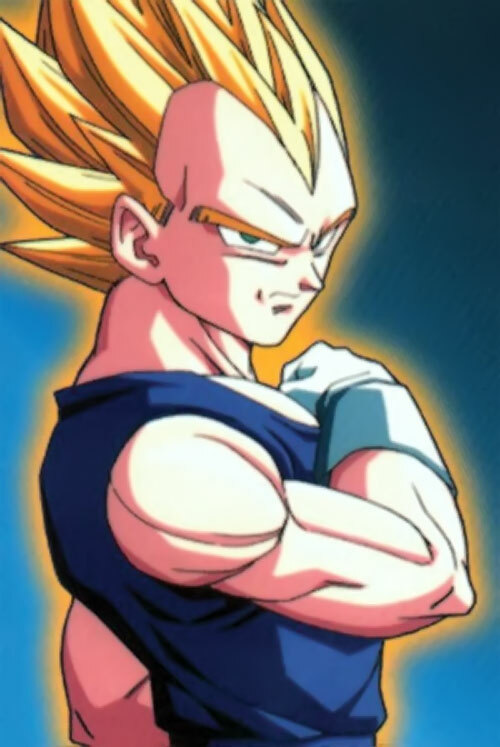 Vegeta is one of the main character in Dragon Ball, a phenomenally successful manga and anime series. Dragon Ball started in 1984 and will continue to exist in some form until the Sun explodes. It is full of immensely powerful, planet-destroying kung-fu. Other Aliases: The Prince of the Saiyans, Prince Vegeta. Known Relatives: King Vegeta (father, deceased), Bulma (wife), Trunks (Son), Bra (Daughter), Dr. Briefs (Father-in-law), Mrs. Briefs (Mother-in-law). Base Of Operations: Japan; Capsule Corp. Headquarters. Height: 5’3” Weight: 170 lbs. Vegeta possesses exceptional physical strength, far greater than that of a human being and in fact far greater than most other alien races. He is capable of lifting thousands of times his own weight. 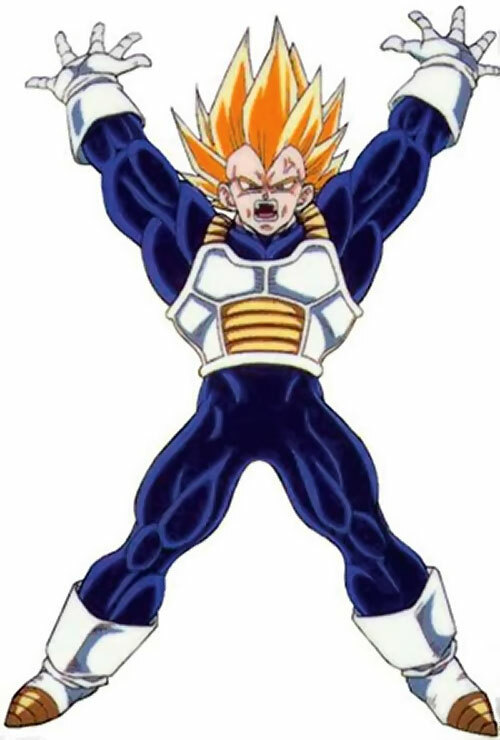 This massive strength is the result of the naturally high gravity of Planet Vegeta and the intense physical training he has endured over the years. Likewise, his resilience to physical trauma and stamina are enhanced as well, making him figuratively invulnerable to harm. Vegeta’s speed and agility are also superhuman. He can react to visual cues in a fraction of a second. This coupled with his startling reflexes allow him to move fast enough to dodge bullets or energy beams without strain. In combat, he moves so rapidly that he becomes invisible to the naked human eye. Like all Saiyans, Vegeta has a natural affinity for manipulating chi energy. With focus and concentration, he can use his own chi to fly at ludicrous speeds or to project variety of powerful energy-based attacks from his body. When fully charged, Vegeta’s most powerful chi blast is capable of causing the destruction of an Earth-sized planet. With training, Vegeta has learned how to not only sense his opponents chi, but to accurately gauge their strength in an instant. Once Vegeta has identified an opponents chi, he is able to instantly recognize it again, effectively preventing his opponents from disguising themselves from him. Upon acquiring this ability, Vegeta learned the reverse of this skill and thus can hide his own chi levels from sensitive opponents. More impressively, Vegeta has learned to harness his rage and attain the Super Saiyan State (q.v.). Like all Saiyans, if Vegeta is ever grievously injured and recovers, his overall power (physical and spiritual) increases. It’s almost as if his body is adapting to prevent that kind of damage from occurring again. Finally, Vegeta is a well trained and incredibly experienced warrior. Every moment that he is not eating or sleeping is essentially spent training. He is constantly attempting to get stronger and will always search for better and/or stronger opponents. He spends most of his free time training in a chamber that generates up to 150x the Earth’s normal gravity. Vegeta’s early life was turbulent and some might say tragic. Despite being born “The Prince of the Saiyans,” his life was not an easy one. The Saiyans were a hard people, and none more so than Vegeta’s father, the Saiyan King. King Vegeta pushed his son like he pushed no other Saiyan, forcing him to partake in lopsided battles just for his own amusement. Fortunately, Vegeta was a prodigy and gifted with more potential than any other Saiyan before him. Vegeta welcomed his father’s challenges, easily defeating all of them, and always demanding stronger foes and increasingly difficult challenges. At this time, Vegeta and the entirety of the Saiyan race were under the rule of the interplanetary warlord Frieza. 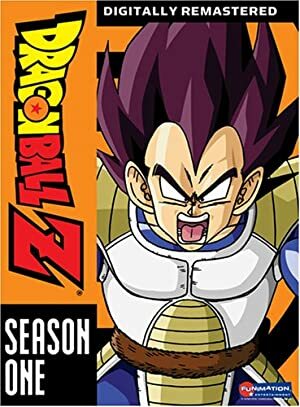 When Vegeta turned 9, Frieza noted that the Saiyans as a people had grown in strength to the point where collectively, they could threaten his rule. He decided in an instant to eliminate their potential threat and with a single powerful blast of energy, he destroyed their home-world, the Planet Vegeta. In an instant, the entirety of the Saiyan race perished, with the exception of four extra-ordinary individuals; Son Goku, Raditz, Vegeta, and Nappa. The 4 Saiyan survivors were all off-planet at the time, and managed to live through the genocide of their people. Frieza kept Vegeta, Nappa and Raditz as slaves to do his bidding, using them to conquer new planets for his empire. Nearly 20 years passed before Vegeta discovered the existence of the mystical artifacts, the Dragonballs. Vegeta and Nappa were in the process of exterminating the indigenous life on a planet that Frieza desired, when they received a strange transmission. The origin of the transmission was a small blue planet, called Earth, where their fellow Saiyan Raditz was searching for his younger brother Kakkarot. Raditz’s transmission told a tale of 7 magical objects known as the Dragon Balls which could grant wishes. Before Vegeta could respond, the transmission was cut off in a burst of static. Vegeta knew that the violent end of the transmission could only mean that Raditz had been killed. With that, the Prince of the Saiyans immediately set a course for earth with Nappa in tow. He acted not out of a sense of vengeance for his fallen ally, but out of greed. Vegeta found himself coveting the Dragon Balls and planned to use them to wish for immortality. He reasoned that with the gift of immortality, he would eventually be powerful enough to rule the galaxy and to eventually challenge Frieza himself. It took a full year for the Saiyans to get to the small blue planet. When they landed, Nappa and Vegeta wreaked havoc with little to stop them. Eventually, they were confronted by earth’s defenders, Piccolo and the ’Z Fighters’. Realizing the vast difference in their respective strength, Vegeta didn’t even bother to fight. Instead, he simply stood still and allowed Nappa to brutally murder all but 3 of the fighters. He would have let Nappa finish of the heroes if they hadn’t kept begging for Son Goku to save them. Curiousity overwhelmed Vegeta, and with a simple command he forced the berserk Nappa to ’heel‘. A brief and terse conversation broke out then, and it revealed two key pieces of information to Vegeta. The first piece confirmed that the Dragon Balls actually worked, and had returned Son Goku to life. The second was that Son Goku was far more powerful than his friends and would provide the bloodthirsty Saiyans with better sport. In a rare moment of mercy, Vegeta gave the Z Fighters a few hours to wait for their savior. Unfortunately for them, Son Goku didn’t arrive in time and when the allotted hour was up, Vegeta unleashed Nappa upon them once more. Son Goku arrived in time to save Krillin and his son Son Gohan, but not in time to save the Namek Piccolo. When Vegeta first laid eyes on Son Goku he realized that there was something unusual about the young warrior garbed in red and held back, allowing Nappa to engage him in battle alone. Son Goku and Nappa’s battle was short and brutal, leaving Nappa crippled and unable to fight. As Nappa pleaded for his life, Vegeta was filled with scorn and disgust. Rather than helping his fallen comrade, Vegeta mercilessly murdered him with a single blast of energy. In an instant, Son Goku and Vegeta became the last two full-blooded members of their race. After a bout of verbal sparring, the two began a battle that would change both of their lives. Despite the incredible amount of training that Goku endured and the impressive new powers he gained, it became abundantly clear over the course of the battle that Vegeta was still much stronger. The fight was an incredible see-saw affair that resulted in Vegeta assuming his “Great-Ape” form and crippling Goku. Only Vegeta’s supreme arrogance allowed the young Saiyan’s survival. Vegeta had assumed that Goku’s friends would be unable to help him, but between Krillin, Gohan and Yajirobe Vegeta was injured severely enough that he not only lost his ability to assume his “Great-Ape” form, but also for the very first time in his life, he had to retreat from battle. Helpless and shamed, Vegeta crawled slowly into this space pod, under the watchful eye of the Z Fighters, and rocketed into the dark regions of space. His pod eventually landed on one of the planets controlled by Frieza where he immediately received medical attention. After being restored to health, Vegeta was informed by Cui, one of his old rivals, that Frieza had also overheard Raditz’s last transmission. Frieza himself realized that the Dragon Balls were actually artifacts of the Namekian race and that he could most likely find another set on the planet Namek. While Vegeta had been fighting on Earth and recovering from his wounds, Frieza had already gone to the planet in search of the Dragon Balls and immortality. Desperate to beat Frieza to the Dragon Balls, Vegeta made his own way to the planet Namek and started cutting a swathe of destruction through the native Namekians in search for them. To his surprise, Vegeta encountered Krillin, Gohan, and Bulma; the very same ’Z Fighters’ who helped defeat him on Earth. In an instant he realized that they were were also in search of the Namekian Dragon Balls, but had had to leave Son Goku behind to heal from the wounds Vegeta had inflicted upon him. With vengeance in his heart, Vegeta attempted to track them down and slaughter the two Earthlings but before he could he encountered Frieza’s forces once more. Vegeta battled his childhood tormentors one at a time and unlike the fights they had in the past, this time the results were very different. 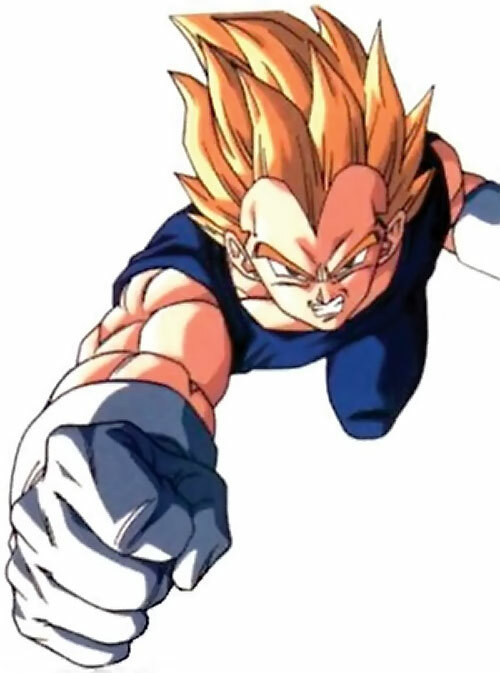 In his youth, Vegeta’s strength been overshadowed by the likes of Cui, Dordoria and Zarbon, but since his encounter with the ’Z Fighters’, Vegeta’s strength had grown exponentially. The three aliens didn’t realize that with every near death experience a Saiyan’s strength increased. One by one, each of the Frieza’s three henchmen were ruthlessly murdered by the Prince of the Saiyans, but not before he learned the true circumstances of Planet Vegeta’s destruction. Through a series of twists, Vegeta eventually found himself forced to ally with the earthlings Krillin and Gohan in order to survive Frieza’s elite team of assassins, the Ginyu Force. The 3 fought with all that they had, but despite Vegeta’s rapid growth in power, they simply weren’t strong enough to defeat the Ginyu force. Instead the 3 fighters found themselves helpless and in danger of execution at the hands of the evil mercenaries, but just when all hope seemed lost, Son Goku arrived on planet Namek. The formerly crippled hero had made a full recovery and had increased his strength as well. Son Goku appeared before Vegeta and the Ginyu force in a blaze of speed, quickly taking his friends to safety and revealing the source of his miraculous recovery. Using Senzu Beans, a magical bean from Earth that instantly heals any injury, Goku restored his friends and Vegeta to health. Vegeta realized that Goku healed him only because he wanted to settle the score between them at a later date. Through a series of brutal battles, the entire Ginyu force fell at the hands of the two Saiyans, but not without great cost. Despite Son Goku’s new found strength vastly overshadowing any individual member of the force, he sustained grievous injuries as a result of the combined battles and needed emergency medical care to survive. Vegeta realized that despite his vastly increased power, he couldn’t defeat Frieza on his own. Reluctantly, he (along with Krillin and Gohan) placed the injured Son Goku into one the healing tanks within Frieza’s abandoned ship. The 3 then settled down to wait for the advanced medical technology within the tank to heal their fallen ally. While waiting, fatigue from his continuous fighting finally caught up with Vegeta and he fell into a deep sleep. While the Saiyan Prince slept, Krillin and Gohan snuck away and gathered the 7 Namekian Dragon Balls and managed to make two wishes before Vegeta awoke, the Dragon Balls’ creator died (rendering them inert) and Frieza arrived. With that, Vegeta realized that his dreams of immortality had escaped him. But despite that and the stories of Frieza’s fabled power, instead of grovelling or begging for his life Vegeta challenged Frieza to open battle, gambling that he had gained enough strength to defeat his former master. He was wrong. Despite help from Krillin, Gohan and the newly resurrected Piccolo Frieza proved to be too powerful to be defeated. With a casual ease, the monster named Frieza dispatched the group of warriors. One by one, they fell to by his hand. Frieza murdered Dende (a young Namek healer), crippled Piccolo and left Gohan and Krillin to watch as he tortured and brutalized Vegeta. Vegeta felt his life slipping away from him and was on the brink of death from Frieza’s assault until in a blaze of light, a renewed Son Goku appeared and yanked him from Frieza’s clutches. Despite Goku’s best efforts though, Frieza would not be denied. 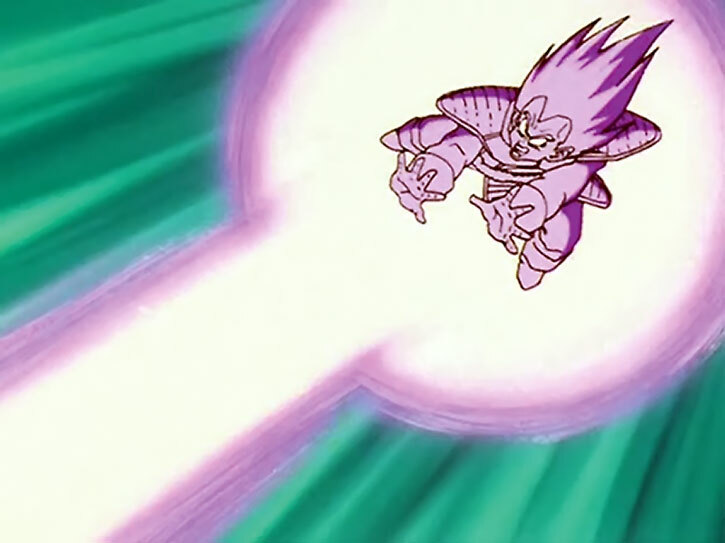 Vegeta watched in slow motion as Frieza fired a beam of energy right through his heart. As he felt himself dying, Vegeta did the one thing he had never done in his life. Crying and begging, Vegeta begged Goku to take vengeance for their people. Goku vowed he would, and with that Vegeta finally surrendered to the darkness and died in peace. Much to his own surprise, Vegeta enjoyed his peaceful respite for mere minutes. He, along with everyone that Frieza had murdered on the planet Namek was resurrected with a wish made on the Earth born Dragon Balls. To add to his shock, for a single brief second he was forced to watch as Goku stood transformed into the legendary Super Saiyan warrior of Saiyan legend. Even as frustration welled up within him, Vegeta found himself mystically teleported back to the planet Earth alongside every living inhabitant on the planet Namek, with the exceptions of Goku and Frieza. Vegeta could only smirk to himself after he realized that he was trapped on a world that he had once tried to destroy, surrounded by beings that hated and feared him. As the Z fighters dispersed and returned to their lives Vegeta found himself with nowhere to go. As he pondered his next move, the Bulma approached him and offered him a place to stay. Her parents were the wealthiest family on the planet and they had plenty of room. Surprised at the offer, but having nothing better at hand, Vegeta agreed. Once a year had past, the Z Fighters once again called upon the power of the Dragon Balls to return their friend and Vegeta’s nemesis, Goku, back to life but all were surprised to discover that he had survived the battle with Frieza and the planet Namek’s destruction. Instead of returning to Earth, the curious Saiyan hero had decided to spend some time on the planet Yardrat training with the strange aliens in the hopes of learning a new combat technique. Vegeta spent the next 2 years training with a fever and intensity that he had never felt in his life. He initially mimicked the training that Goku underwent while making the journey to Namek, and overtime increased the intensity. Slowly but surely, Vegeta lost interest in becoming immortal or conquering worlds. Instead he found himself becoming obsessed with surpassing the achievements of Goku. His one overwhelming desire was to become a Super Saiyan. One day during his training, Vegeta sensed the approach of an old foe, Frieza. The powerful alien had also survived the destruction of the planet Namek and had set his eyes on the planet Earth. Vegeta dropped everything and rushed to the location where Frieza had landed upon his adopted home. As he suspected, the remaining Z Fighters arrived soon thereafter as well. Even as the fighters prepared to throw their full strength at Frieza in a suicidal run, a strange young man appeared, transformed into a Super Saiyan and slaughtered Frieza and his men. A fierce gamut of emotions flowed through Vegeta’s heart at the sight of the young warrior’s power; rage, jealousy, disbelief were but a few. Despite his feelings, when the young warrior pleaded with the Z fighters to wait for Goku to arrive, Vegeta waited silently for his nemesis’s return. Two hours later, Goku finally arrived, blasting into to the earth like a massive cannon ball in an old Saiyan space ship. He and young stranger moved away from the group in order to speak in private. Once again, Vegeta was forced to watch as in his eyes, the two flaunted their power by becoming Super Saiyans. The two warriors spoke briefly, and upon the completion of their conversation the young warrior left. With that, Goku revealed that the young man was a Saiyan that had come from the future to warn the fighters. The traveller had announced that Goku would die from a virus in 3 years. Furthermore, all of the Z fighters would be murdered by powerful androids created by a mad scientist in that time. The young man from the future hoped that by warning the fighters they would be prepared for the worst. In addition, he gave Goku the antidote for the virus he would develop, in order to ensure his presence in the upcoming battle. Humbled and enraged, Vegeta redoubled his efforts to become a Super Saiyan once more. He spent the next 3 years training in seclusion, desperately attempting to accomplish just that. After witnessing Goku, a lower class, and another stranger he doesn’t even recognize as from his race, being Super Saiyans, Vegeta neared his own breaking point. Despite this singular focus, Vegeta started a relationship with Bulma during this time. The relationship became serious and as a result an infant named Trunks was conceived. At the conclusion of the following 3 years, a calm and composed Vegeta set out for the location that the young man from the future told them the androids would appear. He arrived just in time to watch Goku fall at the hands of one of the Androids. Though he should have easily been able to defeat the android, Vegeta instantly recognized that his old foe had begun to suffer from the virus during the battle. Realizing that the android was about to steal his chance at defeating Goku himself, Vegeta intervened. Vegeta then instructed the Z Fighters to get Goku the antidote and leave. The Z fighters expressed their doubts for Vegeta’s survival and the androids scoffed at the Saiyan prince, and yet Vegeta remained not only calm but smug as well. Unknown to the others, he had a secret. In his rage at his own failures and apparent helplessness, Vegeta had shattered the wall that was holding him back. He found the key to becoming a Super Saiyan. With an explosion of fury and power Vegeta transformed, surprising friend and foe alike. Before the two androids could react, the Prince of the Saiyans demolished Android 19 with his awesome power. The remaining android (Android 20) fled the scene of the battle, realizing in an instant that its power could not hope to match Vegeta’s. Vegeta gloated over his victory and enjoyed his newly restored sense of superiority. As he prepared to pursue and destroy the remaining android, the young man from the future returned and with confusion in his voice, informed the fighters that the androids that they fought were not the androids of his future world. During their conversation Piccolo addressed the young man by his given name, Trunks. In a flash, Vegeta finally realized who the strange young man really was; he was his teenaged son from the future. Though it initially surprised him, in the end it mattered little to the battle thirsty Saiyan. After all, he had androids to destroy. With that Vegeta and the Z Fighters took off in pursuit of the remaining Android. When Vegeta learned that Android 20 had set off to activate the more powerful androids he decided to hold back despite the objections of the other Z Fighters. His Saiyan blood burned eagerly as he anticipated the upcoming battle and his obvious victory. Android 20 returned to his lab and reluctantly activated three new Androids, sixteen through nineteen, but as he suspected the three androids were uncontrollable. In the first few instants of their awakening, they destroyed the lab and Android 20. The three androids then flew away from the laboratory while allowing the Z Fighters to follow them. Vegeta callously challenged them to battle, despite several warnings from Trunks. The battle went disastrously for the Z Fighters. Vegeta was not only soundly defeated by Android 18 in mere instants but also to his shame, he was beaten by a woman. The other fighters were even less effective than Vegeta. As the battle came to a close, the Androids grew bored and headed off to fulfill their original objective; to find and kill Goku. After recovering from the vicious beating he took at the hands of Android 18, Vegeta retreated to a lone mountaintop and spent 3 days obsessing over his loss. His fragile pride had suffered yet another blow but unlike the ones before this one, did not threaten to unmake him. Rather it served to galvanize his resolve to face the limits he had found within himself and break them. On the third day, a recovered Goku approached Vegeta (and Trunks who had spent 3 days in silent contemplation alongside his father) and told them of a magical room called the Hyperbolic Time Chamber. The chamber would allow Vegeta to train for a full year within it while a mere day passed outside the room. Vegeta wore an inward smile as he agreed to use the chamber to train. He knew that within that year, he would not only surpass his own limits, he would become the most powerful Saiyan in existence. Vegeta and Trunks spent a year isolated in the Hyperbolic Time Chamber, with nothing to do but push their bodies to the absolute limit. When a year passed within the chamber, the two emerged more powerful than ever. 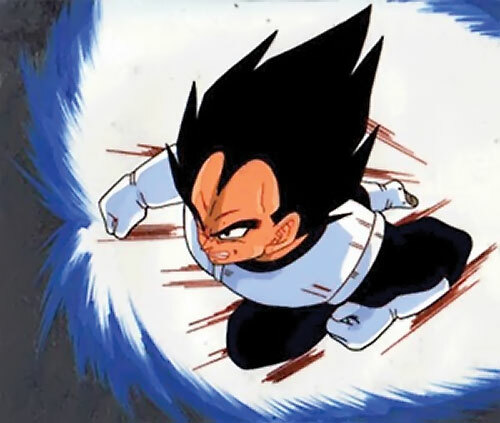 Even as he emerged, the Z Fighters could sense the change in Vegeta. The regal and arrogant Prince of Saiyans had returned with a vengeance. To his slight surprise, Vegeta learned that a new foe had entered the battle field in the year that he had been gone (in truth a mere day had passed in the “real” world). A new android, named Cell, had emerged and had been slaughtering humans and Z Fighters alike. Fascinated that there was a being strong enough to face the Androids and eager to test his new strength, Vegeta blasted away from the Z Fighters lair and rushed to face Cell, with his son reluctantly in tow. Vegeta arrived just in time to see the mighty Piccolo fall at the hands of the manic Android Cell. Despite Cell’s warnings that he didn’t have enough power to beat him, Vegeta stood his ground confidently. As the two were about engage in battle, Vegeta unleashed his true strength reached a state somewhere beyond the Super Saiyan. In this Ascended form, Vegeta completely dominated the evil android. He tossed it to and fro around the battle field like it was some sort of wind up toy that he had grown tired of. Vegeta voiced his disappointment at Cell’s lack of strength, he had been hoping for a true test of his new found might. Cell, playing on Vegeta’s Saiyan pride, begged him to allow him to absorb Android 18. He stated that if he managed to become one with Android 18, that their powers would mingle and the resultant being would become even more powerful than Vegeta currently was. Though Vegeta recognized the android’s ploy immediately, his stubborn pride (and Saiyan nature) could not let him refuse its challenge. Despite Trunks’ objections, Vegeta permitted Cell to capture and absorb Android 18. He even went so far as to strike his own son when Trunks attempted to stop Cell himself. After achieving its perfect form, Vegeta attacked the android once more. Unfortunately for the Prince of Saiyans, the android had not lied. In its transformed state, the android was magnitudes more powerful than Vegeta. Vegeta once again found himself on the receiving end of a savage beating from a superior foe. The mighty Android then fought Trunks, who managed to put up a fight against the perfect Android, but he was eventually defeated as well. Before killing the fallen Saiyans, Cell asked Trunks how they had gotten so strong in a single day. Trunks defiantly replied yes, and that Goku himself would be stronger still. His interest piqued, Cell decided not to kill the Z Fighters. Instead the android decided to hold a tournament based fight that would occur in 10 days time, giving the Z Fighters a chance to recover and gain some strength. You see, Cell was created from the biological matter that made up all of the Z Fighters, including the Saiyans. And like any Saiyan, Cell craved battle with strong opponents. During this time, every one of the Z Fighters take their turn in the Hyperbolic Time Chamber, including Goku and his son Gohan. Once the 10 days had passed, all Z Fighters gathered at the tournament grounds ready to face Cell. When Cell asked who would go first, Goku volunteered, shocking everyone present including Vegeta. As Goku unleashes his full force against Cell, Vegeta came to a slow realization. Despite (or perhaps in-spite of) all of his training, fury, and pride Goku had still managed to surpass him in strength. At that moment, a grudging respect for his nemesis bloomed in Vegeta’s heart and he found himself rooting for Goku. As the fight raged, Vegeta realized that Goku was running out of strength at a rate much faster than the awesome android was. Vegeta knew that Goku had to realize this when he began the fight, and yet he was so calm. His calmness led Vegeta and the other Z Fighters to believe that he had a plan to win. Imagine their overwhelming shock when Goku simply conceded defeat before the fight was close to finished. Disappointed by Goku’s surrender, Cell asked him who would replace him in the tournament. Vegeta steeled himself for battle but was shocked when Goku named his ten year old son as his replacement. Disbelief ran through his heart even as Gohan reluctantly stepped forward to battle the murderous android. Cell battered Gohan about, hoping to elicit a response from Goku but instead was surprised by the resilience of the boy. Vegeta watched as Gohan, while holding back, managed to survive several of Cell’s onslaughts. In an effort to force the child to fight back, Cell created seven miniature versions of himself to assault the Z Fighters. Vegeta, a weakened Goku and the other Z Fighters prepared for battle but quickly found themselves helpless in the hands of the diminutive clones. Gohan watched with helpless fury as his friends and father fell before the clones and eventually his rage unleashed the strength his father knew lay within him. With a burst of energy, Gohan smashed through the limits of the Super Saiyan barrier. Gohan with his awakened power, rescued his friends and dispatched the Cell clones within seconds. He then turned his full attention on Cell, battering the machine mercilessly. Unfortunately, instead of finishing the fight, the young Saiyan took time to gloat and inflict more pain on the android, giving it a chance at a final assault. Cell triggered his self destruct failsafe. Left with no choice Son Goku teleported the evil android away. Unable to escape, Goku was consumed by the explosion. The remaining Z Fighters had only moments to mourn the loss of their dear friend, due to Cell’s miraculous return, alive and stronger than ever. The combination of Piccolo and his Saiyan genes allowed him to heal from the explosion. Vegeta could only watch in stunned silence as with a single blast of energy, Cell murdered Trunks. Something stirred deep within the proud Saiyan. He experienced something he had never felt for another living being before, a profound feeling of loss. In a fit of rage, Vegeta unleashed his full power upon the evil Android, sending barrage after barrage of chi blasts raining down upon his silent foe. As the dust settled, Cell emerged unscathed and impatient. With contemptuous ease, Cell rendered Vegeta helpless once more and using him as bait, goaded Gohan into intercepting the death blow meant for him. Vegeta watched as the young Saiyan, despite his wounds and weariness, arose from the dirt and put all of his remaining strength into a final Kamehameha blast. Cell hurled his own Kamehameha wave to intercept Gohan’s. The two entered a titanic contest of sheer will power and endurance, the first to falter would be consumed by his opponent’s blast. The two remained stalemated for several moments but the inexhaustible strength of the android eventually started to gain an edge. As luck would have it, with his full attention on Gohan Cell didn’t take notice of the Prince of the Saiyan’s rising high into the sky directly behind him bristling with energy. Vegeta unleashed a salvo of energy into Cell’s exposed back in a final act of defiance. As expected the blasts did little damage to the seemingly unbeatable android, but it did gain his attention for a split second. As Cell turned his attention to Vegeta, his concentration on Gohan wavered. With a flash of light and a scream of rage, Gohan’s Kamehameha overwhelmed Cell’s own blast and consumed the Android completely. Vegeta emerged from the battle with Cell a changed man. His greatest nemesis was gone, he had utterly failed to prove his superiority and he realized that his pride nearly caused the end of the world that had grown to be his home. With those thoughts in mind, he came to the conclusion that he would never do battle again. In his grief and confusion, Vegeta left the scene of the battle without a word to the other Z Fighters. Vegeta spent the next 7 years trying to adjust to a “normal” life on Earth. With Goku’s death, his main motivation for the last decade was gone. Instead he obsessed over making his son, Trunks, stronger than both of Goku’s sons. The two spent nearly all of their free time training and sparring within Vegeta’s gravity chamber. One day, as the World Tournament (a martial arts tournament held once a year where opponents from across the globe compete) approached, Gohan dropped in to visit. Despite Gohan’s warm greeting, Vegeta berated him over his lack of commitment to his training over the last several years. The conversation turned to the World Tournament itself, and when Gohan stated that he would participate within it, Vegeta immediately decided that both he and Trunks would compete as well. In his excitement at hearing the news, Gohan unwittingly revealed that his father Goku had been granted a single day of life in order to compete in the Tournament as well. Vegeta took a second to digest Gohan’s words, and then with bravado born of decades of practice he claimed that he would not only beat Gohan and Goten (Goku’s second son who was born shortly after Cell’s death) but that the would also finally have his victory over Goku in the Tournament. With a eagerness and fever that he hadn’t felt in nearly a decade, a reinvigorated Vegeta threw himself into his training in preparation for the fight of his life. Finally, the tournament day arrived and Vegeta and the other Z fighters awaited Goku’s arrival. When he eventually arrived, Vegeta greeted him solemnly with a grudging respect. Despite their outward competitiveness, he had to admit to himself that he missed his longtime foe. To his pleasure, Vegeta and Goku were matched against each other in their very first match of the tournament. Unfortunately, this match would not come to pass. At the onset of the tournament, the Supreme Kai (or god) appeared and warned the Z Fighters that an evil wizard named Babidi had nearly amassed enough power to unleash an evil monster named Majin Buu on the world. They were needed to help defeat him. To Vegeta’s disbelief, Goku believed the Kai and was prepared to leave the tournament. In fact, all of the Z Fighters were ready to leave. Rage and frustration welled up in the Prince of Saiyans heart. He had been robbed of this fight once before and would not stand for it again. Goku, understanding Vegeta’s frustration, promised Vegeta that at the conclusion of the fight with Babidi that he would fight Vegeta. Vegeta argued that Goku had a mere day on Earth and that the battle with Babidi may consume the entire day. With a grin, Goku responded that with Vegeta’s help the battle would probably be over quickly. Vegeta swallowed his rage, and joined the Z fighters as they left to battle the demented wizard, not out of duty to the planet but simply so Goku wouldn’t leave before fighting him. The Z Fighters race alongside the Supreme Kai to Babidi’s ship, but upon their arrival are quickly ambushed by Babidi’s enforcer Dabura. At the conclusion of the attack, only the Kai, Goku, Gohan and Vegeta remain standing. Despite the Kai’s warning, the trio of Saiyan’s boldly enter Babidi’s ship in response for the attack with vengeance and a lust for battle in their hearts. As the Saiyan’s advance through Babidi’s ship they encountered a number of his mystically enslaved warriors, each one stronger than the previous. To the Kai and Babidi’s surprise, the Saiyans defeated each one with ease. During the multiple battles, Vegeta realized that Goku, like his son Gohan, had surpassed the Super Saiyan barrier sometime during his time in the afterlife. Despite all of his training for the last 7 years, he knew there was still a gap in their respective powers. With that his anger and frustration boiled over, and he threatened to simply destroy the ship. As he and Goku argued, Babidi used his sorcery to attempt to enslave Vegeta to his will, turning him into the perfect warrior to defeat his foes. Vegeta realized that all of the warriors they had encountered previously were likewise enslaved by Babidi, and moreso had their power bolstered by Babidi’s sorcery. Instead of struggling against the enchantment, Vegeta welcomed the spell and in an instant became the willing tool of Babidi. In a flash of power, Vegeta’s unleashed his new found strength and blew through the Super Saiyan barrier. The evil wizard then used another spell to transport the Saiyan trio (along with the Kai) back to the tournament grounds. Upon their arrival, Babidi telepathically ordered Vegeta to slay everyone. Vegeta refused the order, instead demanding that Goku give him the fight he had been waiting for. Babidi and Goku are both shocked as they realize that Vegeta still had full control over his mind. Goku refused to fight, understanding that the energy generated by their battle would reinvigorate the monster Buu. He attempted to reason with Vegeta, but his pleas fell on deaf ears. Vegeta, realizing that Goku would not fight him needlessly, fired a casual blast of energy into the crowded auditorium of the tournament, instantly murdering hundreds of innocents. Even the wizard Babidi was taken aback by the callousness of the murderous Saiyan. When Goku stood frozen for a moment, Vegeta sent a second more powerful blast into the now frenzied fans, slaughtering several hundred more. With that Goku could deny the fight no longer. Before the fight began, Goku demanded that Babidi transport the two Saiyans to a place where no more innocents would be at risk. The two Saiyan warriors were instantly teleported to a secluded mountain area, where they could fight in earnest. As the two traded blows Vegeta revealed to Goku that he deliberately let Babidi’s spell to ensnare him in order to allow him to fight Goku as he once was, ruthless and unencumbered by emotion. For the first time in their storied competition with one another, the two found themselves evenly matched. Each blow they landed shattered mountains and caused shockwaves that could be heard from miles away. The resultant energy from their battle caused the unthinkable to happen, they had given Babidi enough energy to awaken the creature Buu. The two halted their battle as soon as they sensed the creatures true power. Vegeta realized that if they didn’t stop the creature immediately, that all hope for their survival would be lost. Reluctantly, he agreed to stop the fight long enough to defeat Buu. As Goku turned his back to retrieve the last Senzu bean that he had, Vegeta struck him from behind, rendering him temporarily senseless. Vegeta swallowed the Senzu bean and fully reinvigorated, flew off to battle Buu on his own. Despite his own arrogance and the wizard’s spell, Vegeta had finally gained the capacity to feel emotions. His own guilt had overtaken his desire to defeat Goku. In moments, Vegeta confronted Buu brimming with power. He attacked without mercy sending wave after wave of chi blasts at his ridiculous looking foe, but despite his increased strength the monster named Buu was unaffected. As the fight continued, Buu eventually grew bored of Vegeta’s antics and pressed his own attack. The creature, like Cell before him, viciously beat Vegeta within an inch of his life. It was only the timely arrival of his son, Trunks, that managed to save his life. Trunks attacked Buu from behind, momentarily stunning the creature and granting Vegeta enough time to recover slightly. Faced with his own end, and that of his son, Vegeta chose to go out on his own terms. In a moment that mimicked his final moments with Goku, Vegeta rendered Trunks unconscious and had Goten take him to safety. He then awaited Buu’s return. When the creature returned, Vegeta bid a final farewell to his family and Goku and then unleashed all his his energy at once, causing a massive explosion that consumed both Buu and his own body. With that, Vegeta died for a second time. Vegeta found himself in purgatory, awaiting his final fate when King Yemma summoned him. To Vegeta’s shock, Yemma informed him that the creature Buu had survived his final assault and murdered nearly every living being on the planet earth. The few beings that he didn’t murder had been physically absorbed into the creatures mass, making it even stronger. Goku had already been resurrected in order to stop the creature and was about to confront the monster but Yemma knew that he would need help. Yemma offered Vegeta a chance for redemption if only he would help Goku battle Buu once more. Without a pause, Vegeta accepted, not for redemptions sake but for the battle itself. Vegeta found himself transported to the land of the living, with his physical body restored. Curiously, like Goku before him, he had a halo that indicated he was still dead. Outside of the halo though, he was hale and ready to fight. As he began to quest about for Buu and Goku, Goku simply appeared out of thin air before him. Goku could barely contain his glee at seeing Vegeta, his hope restored that they could defeat the monstrous Buu. Goku begged Vegeta to put on one of a pair of earrings that he had brought back from the Supreme Kai’s world. The earrings were called the Potara, and would permanently fuse two separate beings into a single gestalt being that combined the powers of the two. Vegeta initially refused for multiple reasons. The idea of his essence being mingled with Goku’s offended him on its own but even worse, while he was with Yemma Vegeta had found out that Goku had been holding back his full strength while the two had fought. In Vegeta’s eyes, Goku had pitied him. As the two argued, Buu arrived and prepared to attack. Goku pleaded with Vegeta to cooperate, but it was only when he told Vegeta that Trunks had been absorbed by Buu as well that Vegeta agreed to the merger. As he put on the earring, Goku thanked Vegeta and let it slip that the merger would be permanent. It was too late for Vegeta to do anything about it however, and with a flash of mystical energy, the two merged into a single being. The gestalt being named himself Vegito and his strength proves to be many many times greater than that of either individual Saiyan. Vegito completely outmaneuvered and overpowered the creature called Buu and threatened to simply disintegrate his foe. In desperation, Buu resorted to absorbing the gestalt Saiyan. Though he was absorbed, Vegito proved to be resistant to the absorption process as well. Instead of being absorbed, the strange circumstances within Buu caused Vegito to separate into Goku and Vegeta once more. The pint sized Saiyans found themselves free to act within Buu’s supernatural body. Through a strange series of actions, Goku and Vegeta located and rescued Gohan, Goten, Trunks, and Piccolo from the confines of Buu’s body. Moreover, Vegeta (having uncovered the knowledge in the afterlife) located the “good” side of Buu and freed him from within the darkness of Buu’s mind. The Saiyan’s escaped from Buu’s body, dragging along their unconscious allies even as Buu’s form morphed back into its original form. With all of his goodness and restraint removed, Majin Buu decided to destroy the Earth. As he prepared a blast so powerful that neither Saiyan could stop it, Vegeta and Goku desperately attempted to gather all of the survivors into one location in order for Goku to teleport them all to safety. As they raced to their children’s sides, Goku spotted Hercule and Dende, and to Vegeta’s confusion he swooped down to rescue them. Vegeta realized that Goku’s delay had cost both of them the time it required to save their children. Even as his anger flared, Goku teleported the small group of 4 to the Kai Planet (the sacred home-world of the Supreme Kai’s), abandoning their children to Buu’s mercy. With that, the Earth was destroyed by Buu’s energy blast. As they appeared on the Kai planet, Vegeta rounded angrily on Goku decrying his actions. Even as his rage threatened to overwhelm him, Goku reminded Vegeta that another set of Dragonballs existed on the new Namek homeworld. He reasoned that they could use those Dragonballs to restore the Earth in its entirety. Mollified, Vegeta accepted Goku’s explanation and then the two began to brainstorm ways to defeat the monster Buu. Unfortunately for the two Buu had not only found where they were hiding, but he had also learned Goku’s teleportation technique though simple observation. In a blink of an eye, the monster Buu simply appeared out of thin air on the Kai planet. Buu was somewhat surprised, as instead of running in fear at his appearance, the two Saiyans started arguing over who would get the opportunity to fight him first. Vegeta and Goku settled the argument by playing a quick game of rock-paper-scissors, which Vegeta lost. Vegeta watched the battle with swelling pride and a final understanding as Goku unleashes his full strength, breaking the final Super Saiyan barrier and engaged Buu directly. He finally understood the secret to Goku’s continuous growth. Despite being a peaceful being, Goku simply loved to fight. He didn’t fight for pride, or just to protect his family, he fought simply to get stronger. Vegeta watched as the two battled to a stalemate and when the two separated for a breather, Vegeta asked Goku why he didn’t simply power all the way up and atomize Buu. Goku informed Vegeta that he would need a few seconds to really power up but he couldn’t do that while fighting with Buu. Vegeta gamely decided to buy Goku enough time, and with that threw himself headlong into battle with their much more powerful foe. Vegeta was quickly overpowered by Buu, but even worse, Goku realized that he had expended too much chi and could not even hold his Super Saiyan form. Fortunately for the Saiyans, the “good” version of Buu emerged and held “evil” Buu’s attention long enough for them to concoct a plan. Vegeta realized that Goku didn’t have enough power left to defeat Buu on his own but by a sufficiently massive Genke Dame (Spirit Bomb) could probably defeat the creature. Vegeta had Goku telepathically relay a message via King Kai to the Nameks to use their DragonBalls to make 3 wishes: the complete restoration of Earth, the resurrection of everyone who had died since the arrival of Babidi who were not evil, and that Goku recovered his full Saiyan strength. The combination of Vegeta’s strategic plan, Goku’s massive strength and the people of Earth’s love for Hercule (who had survived on the Kai planet and pleaded with the resurrected people of earth to share their chi with Goku) finally ended the threat of Buu. More so, to Vegeta’s surprise, he was resurrected with the second wish as well as the evil that once existed within his heart had finally been expunged. Several years passed peacefully after the Saiyan pair returned to Earth. Vegeta fully embraced his family life and went on to father a second child, a young girl named Bra. After the defeat of Buu, Vegeta finally buried the animosity that he had felt for Goku and the two finally became friends, though a friendly rivalry continued to exist between them. The two were prepared to have one final fight at the next World Martial Arts Tournament, when Goku discovered a powerful young fighter at the tournament named Uub. Instead of staying to fight Vegeta, Goku decided to leave immediately in order to train Uub and make him an even more powerful opponent for the future. Vegeta accepted Goku’s departure peacefully and the two shared a final farewell. Deep in his heart, Vegeta realized that their story had not truly ended. He knew that sometime in the future, the two Saiyans would meet again and have a final glorious battle and in that moment, the Prince of Saiyans would finally have his victory. 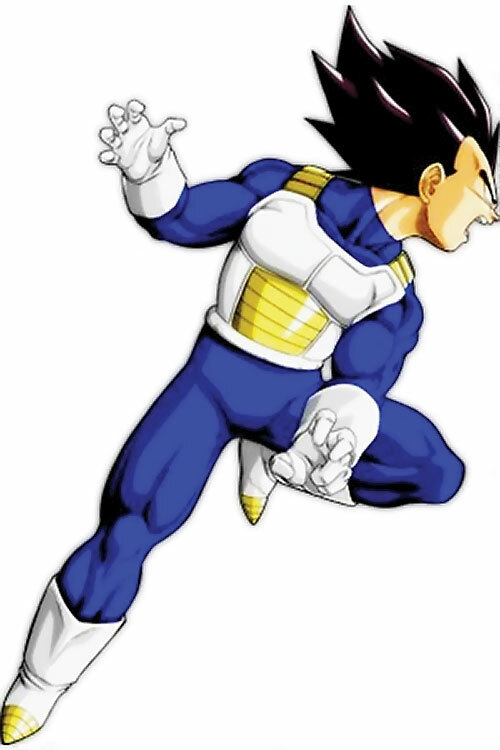 Vegeta appears to be a short, yet stocky, Japanese male in his early 30s. He has a very muscular build (especially once he assumes the Super Saiyan State) and very lean/sharp (some would say predatory) features. 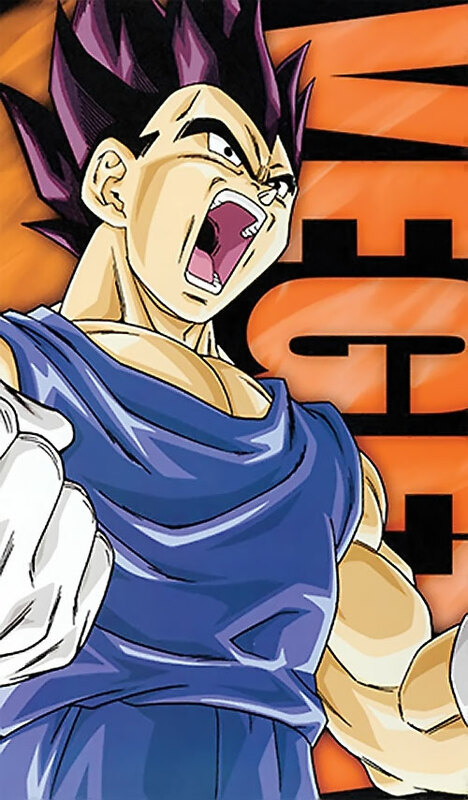 Vegeta’s trademark black hair is worn sweeping back from his head, and he has a prominent widow’s peak. When out of combat, he dresses in casual westernized clothing. When training or in combat though, Vegeta still favours the traditional Saiyan Armour provided by Freeza. The armour is typically a dark blue bodysuit, with white boots and gloves, and his white vest that covers his chest. Vegeta has one overriding trait that you can use to describe his personality. Succinctly put, the man is arrogant; extremely arrogant. His royal status, coupled with his raw power, allowed him to develop an inflated sense of superiority which he is not afraid to let everyone around him hear. He is excessively proud of his Saiyan heritage and believes that his race is the most powerful in the universe. For the majority of his life, his every waking moment was spent obsessing over being recognized as the most powerful warrior in the universe. This obsession becomes even more prominent when he meets Son Goku. At that moment, he is consumed with the desire to prove to himself and everyone else that he is the most powerful Saiyan, and for that matter — being, in the universe. Vegeta’s arrogance is so overwhelming that he cannot allow himself to lose or fail, especially if anyone else is watching. He will never retreat or surrender, even in the face of overwhelming odds. In combat, Vegeta will actively seek out the most powerful foe present and challenge him to single combat. In fact, Vegeta will actually let an opponent take every advantage that they can in order to prevent any excuses for his eventual victory. Once he has entered combat, Vegeta displays the same ruthless glee that consumes all Saiyan’s in battle. He is a born and bred ruthless killer who will show no mercy to his foes; he is fully capable of executing a helpless enemy with remorse. Even with all of his faults, Vegeta does have a few good qualities. He is actually quite intelligent, capable of coming up with tactical plans on the spur of the moment. While he is quite serious, he also displays a wry sense of humour (though mostly this is displayed via mocking his enemies). And despite his abrasive behaviour and speech, it is clear that he truly does care for his family (Bulma and Trunks). He has a deep affection for his wife Bulma and vast pride and love for his son Trunks. By the end of the series, Vegeta developed a deep respect and friendship with Goku though it is doubtful that he would ever admit it. The Saiyans could have been a race of distantly related cousins to Kryptonians or Daxamites, or simply the inhabitants of another planet in the vast DC Universe. Insert Superman into Goku’s place, and Vegeta has another foe to obsess over and continually attempt to defeat. Detect: Discerning (+1); detects overall strength of target (i.e. average AP level, general HP level, etc.). Energy Blast: Area of Effect (+1). Superspeed: Can’t be used to shorten time for Tasks (-1). Astounding Potential, Language (Japanese), Lightning Reflexes, Headquarters (Expansive), Slowed Aging, Rich Friend (Bulma). Son Goku (High), Son Gohan (Low), Bulma (High), Trunks (High). Alter Ego (Super Saiyan 2), Arrogant, CIA (Surpassing Goku), SIA (Fighting Powerful Opponents), SIA (Fighting One on One), Socially Inept, Miscellaneous (Can eat 5x as much as normal human male). SAIYAN ARMOR [/BODY/ 12, Skin Armor: 02, Stretching: 10; Bonuses & Limitations: Partial Armor: can be bypassed with a successful Trick Shot, Stretching used to accommodate Saiyan Oozaru form (-1)]. Like all Saiyans, every near-death experience exponentially increases Vegeta’s power. To simulate this in-game, if Vegeta is ever dying and then manages to recover through any means, he can then immediately apply his Astounding Potential advantage. Conversely, outside of these types of moments, Vegeta is unable to utilize the advantage whatsoever. In reality this ability wasn’t unique to a single being; instead it could be achieved by any Saiyan that possessed the right combination of genes, experience and most importantly, need. Vegeta first achieved this state by drawing upon the sheer frustration he felt at being unable to surpass the deeds of Goku. Upon assuming this volatile state of being, Vegeta’s internal floodgates are thrown wide open, causing excess energy to radiate from his body in the form of a pulsing, golden, flame-like aura with noticeable sparks of electricity pulsing throughout the flames. In addition, his physical appearance alters slightly. His hair becomes golden in colour while growing longer, spichier and standing on end, giving it a raised, flame-like appearance. His black eyes change to a greenish-blue, while his muscles engorge with blood, becoming larger and more defined. 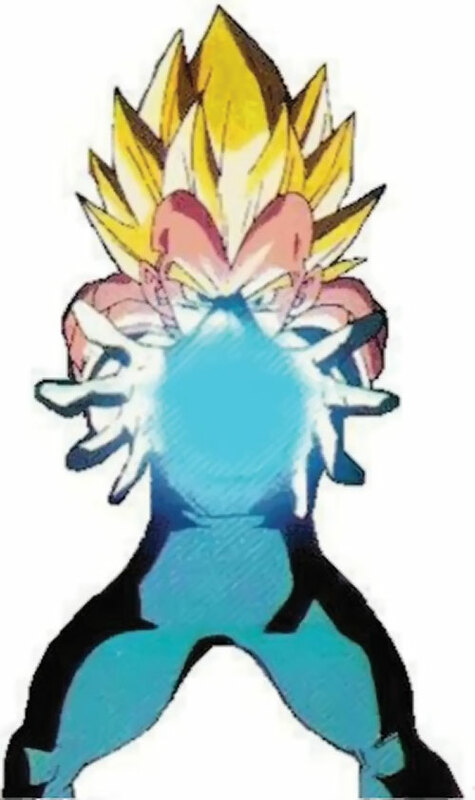 When Vegeta enters this state, his Alter Ego changes are: STR: 22, BOD: 18 and his Energy Blast, Flight, Reflection/Deflection, SuperSpeed and Flight are all increased by +4 APS. He also gains Flash: 1 AP (Flash is Always On, and is Steady Illumination Only). In addition, he also gains the Increased Reserves Schtick in this state, allowing him to Push any of his abilities to 3x their maximum value. This state does come with its own disadvantages: Vegeta obviously gains the Strange Appearance drawback while the state is active, but his IA are also ramped up in this state. Consider all of his IA increased by a level (i.e. SIAs move to CIAs). Welcome to Super Vegeta’s [insert name here] Attack ! 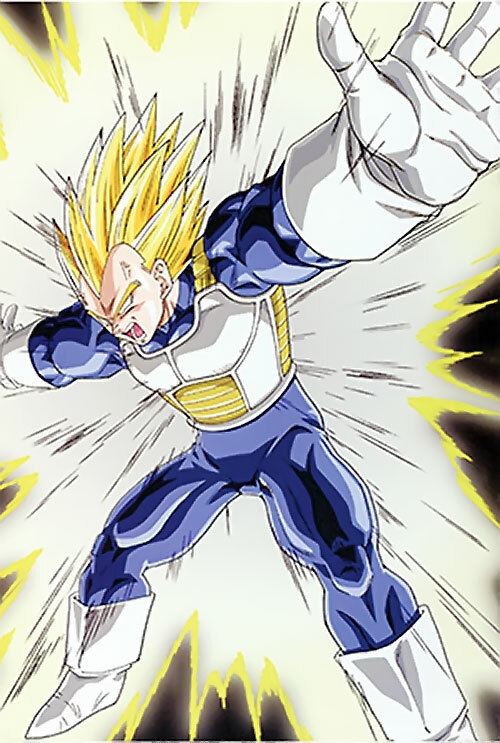 Over the course of his many adventures, Vegeta has developed a unique répertoire of chi-based energy attacks and over time has refined them into far more powerful and effective waves/beams of destruction. As he became more proficient doing this, he became more and more creative when naming his attacks. His three favourite attacks (in order of ever increasing power) are: Gyarikku Ho! (Galick Gun), Biggu Ban Atakku (Big Bang Attack), and Fainaru Furashhu (Final Flash). In game terms, before firing off these types of planet breaking blasts, Vegeta will spend time ramming HPs into his Energy Blast’s EV (Pushing) and eventually when the attack is ready, he “Goes For Broke” and unleashes the attack. The one proviso to these types of attacks is that Vegeta cannot raise the EV of his Energy Blast by more that it’s APs in a single phase and may not take any other action while building his energy for the attack. 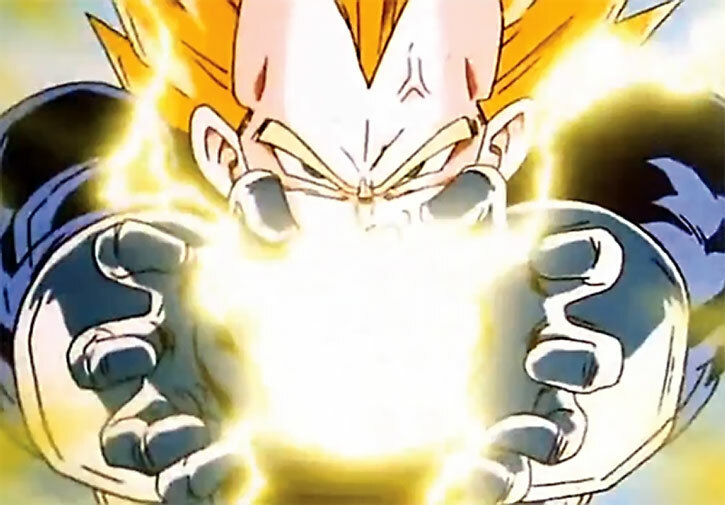 NOTE: When in his Super Saiyan state, Vegeta is fully capable of unleashing a 54 AP Energy Blast. The Astounding Potential Advantage denotes the case of a character who rapidly improves their various stats and develop new Powers, Skills, increase various Attributes, etc. This is, of course, an intrinsically game-breaking ability; especially since in many campaigns, the baseline Character Advancement rules are considered to be too rapid and some sort of house rule multiplier is slapped onto Character Advancement costs. Thus, it does not have a cost or any precise rules. Replicating this effect with a Player Character is presumably best done by setting aside a large number of Hero Points at character creation, and agreeing with the GM that they can’t be used normally but only to improve the Character following the character creation (rather than Character Advancement) rules. Source of Character: Dragon Ball Z Manga. Helper(s): WORG Writeups (Son Goku, Son Gohan and Naruto (Early)), Surbrook’s Stuff Writeup (Vegeta), Ethan Roe, Tom Eilers, Roy Cowan, Sébastien Andrivet, Darci, Peter S. Piispanen.